The highest pagoda in all of Japan. It stands at 187ft. Toji Temple in Kyoto, Japan has got to be one of the most beautiful places we have ever been to. I just had to share this picturesque, absolutely zen place with you. I am sure you noticed that there was no post last week. Truth be told, we were having too much fun in Tokyo and Kyoto before that. I had tried to write ahead, but l was so excited about the trip that l couldn’t concentrate. We had also gotten the tickets rather cheaply, thanks to an error fare, so l was afraid the airline would realize their mistake and cancel our tickets. If l had made it public knowledge, then had to cancel, l would have looked like a schmuck..and would have been very angry :-) . I promise to fill you in on the trip once l am over the jet lag and can focus a bit. In the meantime, enjoy the postcard. 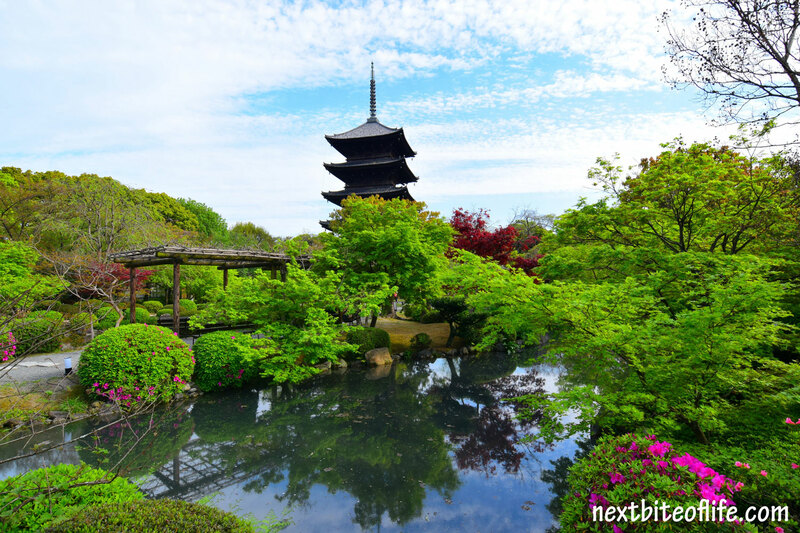 This picture is from the gardens of one of the most famous temples. The Toji Temple in Kyoto. My goodness, there is a ton of them all over this little city. A ton! Temples and Shrines. It was impossible to fit more than two or three into our three night visit to Kyoto. The only sucky part of the trip was that we missed the cherry blossom season in Japan. I was so looking forward to the burst of colors, but wouldn’t you know our timing was wrong :-( . I had read the best time to see them was early April, but those suckers bloomed starting March 21, so there was very little of them still around. We got to see some, but it would have been nice to see the full on bloom. As it was, my allergies were killing me, so maybe it’s just as well. Sayonara for now! :-) . Any cherry blossoms in your neck of the woods? If so, did you enjoy them..or do you have allergies like yours truly? Wow! That looks amazingly peaceful! Beautiful Kemkem, I was wondering how the trip was going – especially after hearing about the earthquake in Japan. Look forward to your posts, it’s on our list for later this year. I think I want your life. Looking forward to the posts. Just looking at that photo brought me inner peace! Can’t wait to hear the trip details! AND SO happy to hear this trip had good vibes around it (a positive airfare mistake) rather than the one to Majorca! Guess goods and bads have to even out! Haha! It was definitely much better than the failed trip :-) . It sis have to even up didn’t it?? I am glad it did. You’re right, it was easy to feel peaceful in that garden. Really blissful :-) . Aahh…I’ve been wanting to go to Japan. Beautiful postcard and looking forward to more of your Japan posts! By the way, it’s hard to read your site from the homepage because whenever the slide changes, the page shifts to a different spot. We had it in the back of our minds and it resurfaced when writing the wish list for 2016. When the opportunity arose, we had to pounce.. :-) . Thanks for letting me know about that. I will remove the slider. I thought it was just on my iPad, and found it annoying… :-) . Gorgeous picture, it must have been so relaxing there. Japan is top of my list and I can’t wait to hear more about your trip. We have some cherry trees in blossom at the moment, but nothing as spectacular as what they have there in Japan. Sorry your allergies are playing up, this time of the year can be hard with the pollen count being high. It was worth the allergy attacks :-) . I too wish we had seen the full bloom, damn the pollen count :-) . I have to admit, it was really relaxing. Federico did not want to go in at first, but l insisted and once inside, he got the most spectacular pictures and really enjoyed the gardens. He admitted that he had been wrong..haha! Love it when that happens. I can’t wait to read all about Japan. I’ve never been, and only know two people who have and both of them live next door to me and are young German lawyers lol! Lovely temple photo by the way but shame about the allergies. Sadly, I know what you mean, as I’m asthmatic which is why I prefer cooler weather or destinations near water…..! You know, l never think about the allergies when l think of places to go. Imagine that l had been hoping to see the full on cherry blossoms. I read how hard it was to get your medications in that l didn’t even think to bring the inhaler which would have made life a whole lot easier..haha! Had l known we would like it so, l think l would have made it longer than 12 days. One of my older sisters was just telling me about her visit 33 years ago!!!! She loved it too then..imagine..she remembers the niceness and the kindness of the people most of all.